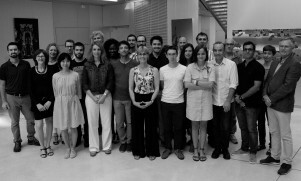 We are a multidisciplinary research team gathering scientists from various domains: mathematics, medical imaging, nuclear medicine, signal processing, psychiatry and cognitive neurosciences. Our research attempts at understanding the cognitive, behavioural, genetic, and brain morphological/functional underpinnings of the human brain hemispheric specialization (HS). Hemispheric specialization is a relationship between a cognitive function and a set of cerebral structures of a given hemisphere. It includes both the hosting of specialized networks that have unique functional properties and mechanisms that allow inter-hemispheric coordination necessary for effective cognitive processing. The observations of patients with brain lesions since that of Broca in 1860 showed that the peculiarity of the SH of Humans is its low variability. For example more than 90% of the human beings have language functions in the left hemisphere and visuo-spatial attention by the right hemisphere. 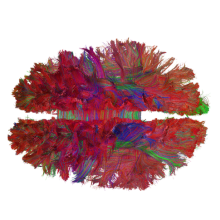 Studies of people with developmental diseases that cause language abnormalities such as dysphasia or dyslexia have shown that these subjects are less asymmetrical at the brain level. This is also the case in certain psychoses such as schizophrenia. But the origin and the factors of variability the HS remains poorly known in part because of its low variability. 2- to characterize the neural support of the late maturational stages of healthy brain within the frame of the i-Share cohort of students’ health conducted by C Tzourio. 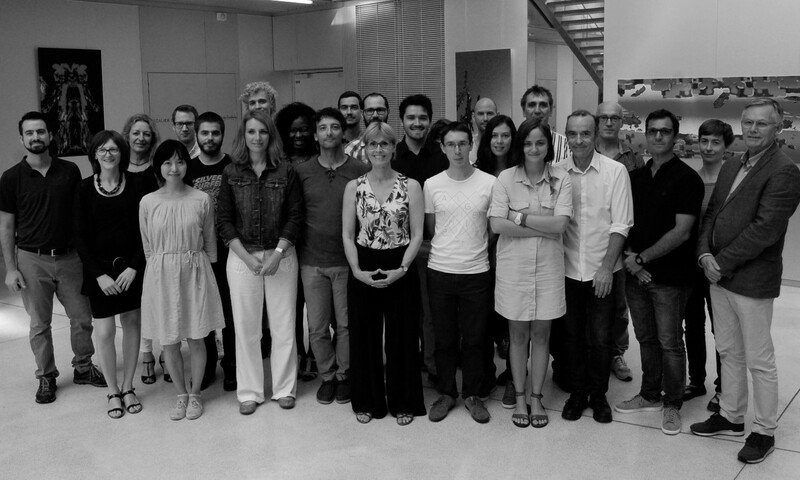 We are currently acquiring brain anatomical and functional images in 2,000 students of Bordeaux University. Exploring the rules for the setting up of the different hemispheric specializations. Hemispheric specialization and cognitive skills. Comparison of left and right hemispheres integrating anatomical, resting-state and task-induced related organization. Unmasking cognitive networks and their lateralization from intrinsic connectivity. Genetics of brain lateralization (Multiple collaborations with Dana, ENIGMA consortium; C Francks, MPI Nijmegen; Ml Carreiras, BCBL, San Sebastian; H Adams, Erasmus Univ. Rotterdam). How does the hemispherical cerebral organization of cognitive functions take place? How does it happen that some people atypically shelter language in their right hemisphere? Is hemispheric lateralization necessary for optimal cerebral and cognitive functioning? If yes, for which functions? Are the subjects atypical for a given also have atypical organization of other cognitive networks? Are anatomical asymmetries markers of functional asymmetries? Can we determine non-invasively the lateralization for the language of an individual? Do atypical individuals have genetic features that explain their change in lateralization? 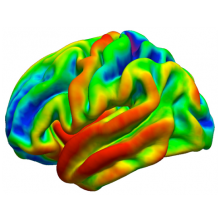 To answer these questions we combine anatomical, functional neuroimaging, connectivity measures, behavioral data, genotyping and databasing. A complete map of the cerebral connections, the connectome, is required for interpreting measurements of the signals transmitted between neurons. In the human brain, these signals travel in a complex network of 100 billion or so neurons, each of which is connected to 10,000 others, through the axons which constitute the bundles of white matter fibers. Identifying these pathways of connections is a first approach to establish such a map. Another approach, known as functional connectivity, is to follow the spontaneous activity synchronized between the groups of neurons. The combination of these two approaches is possible thanks to the advances of both anatomical and functional Magnetic Resonance Imaging (MRI) technologies. 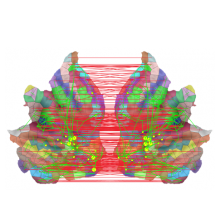 Our project deals with this new framework of the modern neuroscience, the connectomics, which examines the anatomical organization and the functioning of the brain through the connectome to relate it with the cognitive functioning. 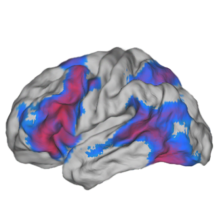 Population neuroimaging aims to identify the different potential sources of brain variability and to measure the size of their effects and their interaction. It is our area of research whose contributions are important from both cognitive, societal, and medical perspectives. Population neuroimaging has an important role to play in face of the many questions and preconceptions that give rise to particularly hot debates such as for example the relationship between brain and mind, the respective roles of genes and environment on the morphology, organization, functional architecture, and performances of our brains, whether or not a sexual brain exists, the differences between left-handers and right-handers, etc. Finally, from medical and healthcare perspectives, understanding what is at the source of cerebral variability and quantifying the limits of its “normality” are of course fundamental to progress on the definition, diagnosis and development of new therapeutic approaches to cerebral diseases.